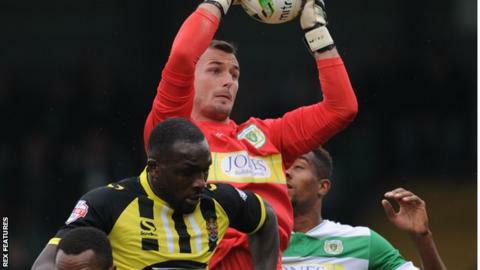 Strugglers Yeovil and Dagenham shared the points as the hosts battled from two goals down at Huish Park. Kane Ferdinand nodded the visitors in front before Frankie Raymond flashed a fierce shot past Artur Krysiak. Yeovil improved, and forced their way back into the game when Ryan Bird headed in Connor Roberts' cross. The hosts levelled thanks to some good fortune as visiting keeper Liam O'Brien punched the ball off the back of Jakub Sokolik and it rolled over the line. "Our shape was good out of possession and we knew we had pace on the counter-attack. We were a real threat going forward and I think we were worthy of a lead certainly at half-time. "We had to make a forced change at half-time and maybe it sort of stopped out momentum a bit. In the end, we're disappointed to have only take a point." Match ends, Yeovil Town 2, Dagenham and Redbridge 2. Second Half ends, Yeovil Town 2, Dagenham and Redbridge 2. Attempt missed. Kane Ferdinand (Dagenham and Redbridge) left footed shot from outside the box is close, but misses to the right. Jake Mulraney (Dagenham and Redbridge) wins a free kick in the attacking half. Marc Laird (Yeovil Town) wins a free kick in the defensive half. Foul by Kane Ferdinand (Dagenham and Redbridge). Corner, Dagenham and Redbridge. Conceded by Stephen Arthurworrey. Substitution, Dagenham and Redbridge. Frankie Sutherland replaces Ade Yusuff. Attempt missed. Shaun Jeffers (Yeovil Town) header from the centre of the box is just a bit too high. Attempt missed. Shaun Jeffers (Yeovil Town) header from the centre of the box misses to the left. Goal! Yeovil Town 2, Dagenham and Redbridge 2. Jakub Sokolik (Yeovil Town) with an attempt from the centre of the box to the bottom right corner following a corner. Corner, Yeovil Town. Conceded by Nyron Nosworthy. Attempt blocked. Wes Fogden (Yeovil Town) right footed shot from outside the box is blocked. Attempt missed. Shaun Jeffers (Yeovil Town) header from the right side of the six yard box is close, but misses to the right. Goal! Yeovil Town 1, Dagenham and Redbridge 2. Ryan Bird (Yeovil Town) header from the centre of the box to the bottom left corner. Assisted by Connor Roberts with a cross. Corner, Yeovil Town. Conceded by Justin Hoyte. Attempt saved. Harry Cornick (Yeovil Town) right footed shot from the centre of the box is saved in the top centre of the goal. Kane Ferdinand (Dagenham and Redbridge) wins a free kick in the defensive half. Frankie Raymond (Dagenham and Redbridge) wins a free kick in the attacking half. Hand ball by Ryan Dickson (Yeovil Town). Substitution, Yeovil Town. Shaun Jeffers replaces Matthew Dolan. Second Half begins Yeovil Town 0, Dagenham and Redbridge 2. Substitution, Dagenham and Redbridge. Ade Yusuff replaces Jodi Jones because of an injury. Substitution, Yeovil Town. Jakub Sokolik replaces Jake Howells. First Half ends, Yeovil Town 0, Dagenham and Redbridge 2. Attempt saved. Frankie Raymond (Dagenham and Redbridge) left footed shot from outside the box is saved in the centre of the goal. Nathan Smith (Yeovil Town) is shown the yellow card for a bad foul. Ashley Chambers (Dagenham and Redbridge) wins a free kick in the attacking half. Goal! Yeovil Town 0, Dagenham and Redbridge 2. Frankie Raymond (Dagenham and Redbridge) left footed shot from outside the box to the top right corner. Attempt saved. Ryan Bird (Yeovil Town) header from the centre of the box is saved in the top centre of the goal.